Calendar with chipboard back. Academic year-July through June. 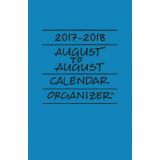 Calendar, 8 1/2" x 11"
Hand lettered August to August calendar organizer. Wire binding. 60# paper. Assorted colors. 5 1⁄2" x 8 1⁄2". 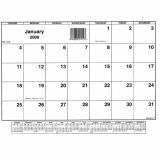 Includes week- and month-at-a-glance calendars, plus address, expense and note sections.